Laura Friesel has developed a unique art form she calls “lace painting”. 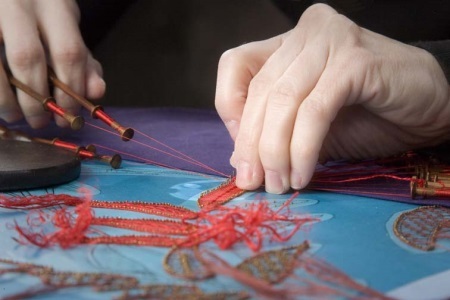 No other contemporary lace maker has pushed the craft so far beyond the traditional edgings and ornament for which lace is conventionally used. She “paints with lace” and uses her skills to make art that will preserve the craft. In designing her art, Laura draws on the unique properties of lace that permit endless creative possibilities. Lace fabrics can be ruggedly dense or gossamer fine. Each style, Torchon, Chantilly, Russian, Honiton, Milanese, among many, has particular qualities that can be combined to create interesting textures, a sense of movement, a depth of layering. Each thread is manipulated individually and the various fibers, cotton, linen, silk, in colors of every hue and finish, make it possible to create effects that range from the refreshingly contemporary to subtly traditional. The mounting surface and the frame for the finished piece are important to the overall design.